Does Dog Shampoo Really Make the Coat White? Optical brighteners are added to whitening shampoos to restore a pristine appearance. Like a tattered blanket, yellowed and forgotten, a white dog's coat will lose its radiance over time due to the absorption of UV light. Specialty shampoos containing optical brighteners are available online and at pet product retailers, and can reduce yellowing resulting from time, dirt and stains. In the color spectrum, it is how the human eye perceives and the brain defines blue to be blue, red to be red, or green to be green that creates the miraculous appearance of a rainbow. 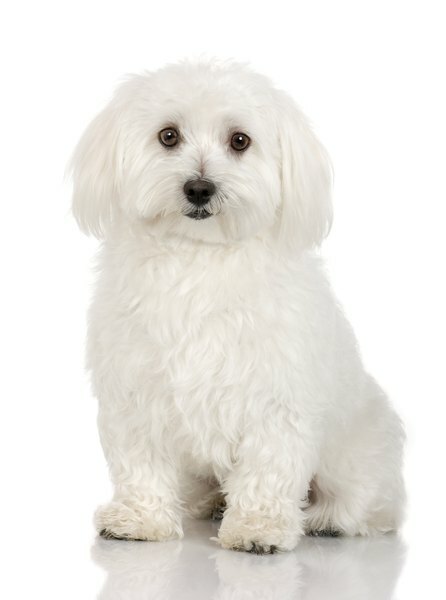 The same holds true in how the elegant white coat of the bichon frise, the Great Pyrenees or the American white shepherd appears to the passerby. Optical brighteners are added to whitening shampoos to alter the way the human eye perceives the dog's coat color. The coat, which generally will yellow over time, is seen as a brighter white as it absorbs light in the UV spectrum and emits it into the blue spectrum, altering the way it appears to the human eye. Shampoos specifically designed to whiten a dog's coat are used by dog owners, groomers, and those on the dog show circuit all over the world, but does it make the dog's coat white? If perception is reality, then yes, the optical whitener will make the coat white, as it alters the appearance to the naked eye. Sorting through the wasteland of a multitude of products and coming up with the right choice can be difficult, as with most of the life's essentials, not all whitening shampoos are the same. Some additives can be harmful to a dog's skin, especially if he has an allergy or sensitivity. Not all products on today's market produce the same results. Bluing agents don't remove stains, but will alter the appearance of the white coat. Clarifying shampoos reduce stains from urine, licking and the sun. Enzymatic shampoos remove stains, but may require multiple applications. Bleaching and dyeing shampoos can produce the desired whitening, but can be harsher to a dog's skin, and require additional care and proper conditioning of a dog's coat after use. The downside of raising the white dog is life's endless supply of dirt, which seems to lurk everywhere. Unless you keep your canine companion in a plastic bubble, he is going to get dirty, but can you keep him white, even if it is just for a few precious moments? It appears you can, as whitening shampoos do produce results. The right choice ultimately will come down to the desired result, and whether your white dog is headed for possible glory on the show circuit, or just wants to be adorable with his white coat and blue bow when Grandma comes for a visit. What Are Black & White Short-Haired Cats Called?